Fraser Cain: Pamela, ready to hurt people’s brains again? Fraser: It’s so much fun and it’s so easy. This week is going to be a little easier on the mind and a little more connected to astronomy which will be great. Last week we took a peek into the tiny world of quantum mechanics and its unintuitive but very accurate mathematical predictions. Although we all appreciate the physics lessons you’re probably wondering what all of this has to do with astronomy. Today we bring it all home and explain how quantum mechanics has given astronomers one of the most powerful tools they have to study the nature of the cosmos. Okay so we’ve got quantum mechanics, it is the probabilistic nature that electrons and particles work at the tiniest levels. What on Earth does this have to do with astronomy? Pamela: [Laughter] Everything. It has to do with everything, most centrally in trying to understand this whole red shift thing that we’ve talked about so much, the Doppler shifting of light. We wouldn’t be able to measure that Doppler shifting if it wasn’t for the specifics of spectra. If you see just one photon you don’t know what’s happened to that photon. You don’t know if it is red shifted, blue shifted or anything else. If you have however a whole family of photons of a variety of different colors that were all emitted from one object that family of photons, that spectrum is likely to have distinctive patterns that are characteristic of the temperature of whatever gave off the light and of the composition of whatever gave off the light. Both that fingerprint due to the temperature, the black body spectra, the curve of where does most of the light come out is a function of wavelength. That has to do with one part of quantum mechanics. The fingerprint of all of the different atomic and molecular lines, the specific colors at which a different atom absorbs and emits photons also has to do with quantum mechanics. Everything we understand about what things are made of where they are and where they’re going all comes from our understanding of quantum mechanics. Fraser: Let’s just give an example of the range of spectra that might be coming off of an object. Take the sun for example. What if we could look at the sun at all wavelengths simultaneously, what would we see? Pamela: We’d see two different physical features superimposed on one another. The first thing that we see is what we call the continuum radiation. This is a curve of light where we can see very quickly that the sun gives off light in the radio but not a lot. It gives off light in the x-ray but not a lot except in occasional short flarey bursts. But ignoring the short flarey bursts the sun in general doesn’t give off a lot of energy in the extremes. If you go extreme enough it gives off no energy. As you work you way to the middle we see that the amount of energy being given off, the number of photons given off at any given color increases as we work our way inwards until we finally hit on a specific shade of green. At that color the sun is giving off the most of its light. The shape of this curve which is much steeper in the blue than it is in the red is entirely defined through quantum mechanics. Fraser: Would you say that’s sort of almost like the sun’s fingerprint? Is it a unique or mostly unique set of wavelengths that are only coming from say our sun or very similar stars? Pamela: We’re not quite there yet. This is just the temperature. If I heat a rock up to the exact same temperature of the sun, it’s going to have the exact same black body radiation. Fraser: Ah, okay so any object of any temperature is going to give off the exact same temperature signature in this black body radiation. Pamela: Right. The basic definition of black body is something that is a perfect absorber and emitter of light. It gives things off strictly as a function of temperature and there’s this very distinctive curve. The hotter something is the more steeply curved towards the blue the curve is. So something that is 5,000 degrees Kelvin is going to give off a lot more energy in short wavelengths. Wavelengths that are just bordering on not being able to be seen with your eye than an object that’s say 3,000 degrees which is going to start giving off most of its light in wavelengths longer than you can easily see with your eye. Fraser: Then the color of a black body object is the averaging out of the photons that we’re seeing. Pamela: Right our eye handles that for us. There is of course integrated your eye says oh, I can’t see these colors I see these colors so there is a lot of faking going on in terms of if you do a complete map you suspect the sun should be green. You look at the sun and you actually see it as white if you ignore the atmosphere. Fraser: I guess I was getting ahead of us, right? So, what is the part then that changes the black body to give the sun its specific fingerprint? Pamela: This is where the atoms in the atmosphere of the sun get involved. Down in the core of the sun we have nuclear reactions going on that are emitting light all the time. They’re actually emitting extremely high energy light. These high energy particles, not so much particles but these high energy photons are getting absorbed and readmitted as they randomly walk their way out toward the surface of the sun. Eventually they end up hitting a zone where they just start heating stuff up. That heated material convectively rises and sinks through the outer layers of the sun until finally they burble to the surface and you start getting the thermal emission. As this emission tries to escape it passes through gas that has a varied composition. The sun is mostly hydrogen. It also has a fair amount of helium. It also has things like iron, titanium and strontium and all sorts of complicated atoms. Each of these different atoms has electrons in complicated shells that are able to absorb and then reemit that light. The majority of light from the sun is trying to get out through the surface. If I start absorbing light in one specific color and then redirecting that light out in a randomized direction, not as much of that specific color is going to go out as it would if I wasn’t absorbing and reemitting in random directions. It’s like if you suddenly throw tennis balls at me. If I wasn’t there the tennis balls would all hit the wall behind me. If instead you’re throwing at me and I’m catching them and then randomly throwing them in all different directions tennis balls are going to go everywhere. The wall behind me isn’t going to get as many tennis balls as it would if I wasn’t there. Fraser: So we’ve got elements in the sun’s upper atmosphere that are absorbing and changing the nature of the light. I guess what exactly is going on with those elements and I guess that’s where quantum mechanics comes in, right? Pamela: This is exactly where quantum mechanics comes in. What ends up happening is the electrons in any particular atom are only allowed to be in certain what we call shells. You might have learned these as orbitals in high school but that tends to make people confused because they think of orbits like planets. Planets can be anywhere in the solar system. Electrons can only be in very specific places in any given atom. Those places that they’re allowed to be have specific energies. The allowed energies are determined by how much mass is there down in the center of the atom. This means that even though hydrogen and deuterium are both really the same thing they’re both an atom that has one proton. The deuterium has extra mass down in the center. It has a neutron in the center. These two almost identical atoms actually have slightly different spectra; slightly different fingerprints of light that they’re able to absorb and emit because of this difference in mass in the center. The spectra are also determined by how much charge is there in the system. If I start removing electrons from an atom it is going to have a different spectrum than an atom that had its full contingency of electrons. All these things work together to define the big picture spectra. The big electron jumps where an electron for instance in a hydrogen atom might jump from its lowest energy orbital up to its next orbital up to its next orbital. I can define this very specific fingerprint just by looking at what is the mass of the system, what is the charge in the system. It gets a little bit complicated because of all the constants and there are crazy powers but it is something I can calculate for the hydrogen atom with only reasonable amounts of pain. [Laughter] It starts getting really hairy once you start getting to think like even a helium atom will make your typical fourth year physics undergrad cry. Fraser: Okay, then what’s the process then that an astronomer uses to measure the spectra? Pamela: This is the easy part. You go out and we use what are typically called grizoms where it slits to spread the light out in different ways. It’s usually actually a combination of these. You take the light, you take only a slits’ worth of the light though. You can imagine taking two razor blades holding them up in front of the sun so that they’re just barely not touching each other. They’re only a hair’s width apart. Passing the sunlight through this pair of razor blades and then after it goes through the razor blades reflecting it off of what is called a grizom. It is basically a mirror that has a bunch of very fine – we’ll find a picture of one – they basically look like they have a bunch of little saw teeth on them. This has the same effect that a prism has; the same effect that that carefully cut piece of glass that you might have hanging up in a window has of taking a light and spreading it out into a rainbow. Then we measure that rainbow. We look specifically at what colors do and don’t have a lot of photons in them. We count the photons in each and every color event and that’s our spectra. Fraser: You’re like measuring the thickness of the rainbow. You’re measuring like how wide is the green part and how wide is the yellow part comparatively. Pamela: More than that we’re saying that at this specific shade of red I have this many photons. At this very slightly different shade of red I have this other different number of photons that tells me this system has hydrogen emission and hydrogen absorption. I look for that emission and absorption above the black body an amount of light that I can’t account for strictly by how hot the object is. That’s where the spectra lines are. Fraser: I guess if you were specifically looking for hydrogen emission for example, how would that look in the spectra? Pamela: There is a distinct pattern of lines that you get depending on what the energy level of the electrons is that are jumping back and forth. The series that we talk about most is the bomber series. This is actually where we start having not the lowest energy level transitions but transitions in and out of the second energy level of the atom. This is going from the third level to the second is what we call hydrogen alpha. This is a nice bright easy to see red line. It’s at 656.3 nanometers. There’s actually a road in New Mexico that goes up to Apache Point Observatory that I’ve heard – I haven’t confirmed this – actually has that number as the road number. There’s hydrogen beta – we have foreign names for these lines – it’s a blue-green line. We can calculate what wavelengths are each of these lights going to come out for. Then we look for lines at those separations. It’s the separations that actually matter because if the light source, if the star if the galaxy that’s emitting the light or absorbing the light is coming towards us or flying away from us which is much more common, we’ll see this entire pattern shifted. Pamela: Six hundred fifty-six point three nanometers for hydrogen output. Fraser: Okay so you’re going to see an unusual number more for example of photons in that exact point along the spectra. That tells you okay great we’ve got hydrogen absorption. What does that mean? Pamela: If you have extra it’s actually emission. This means that you have excited gas. If you heat gas up just the right way and it is a pure gas like hydrogen it is going to start emitting that light. We get emission lines like this if I have a hot star off to the right shining its light on a nebula straight in front of me. The nebula is going to absorb all the light that is coming from that star off to the right. The light that might otherwise want to keep going through my field of view never once hitting me the hydrogen gas in that nebula is going to absorb that 656.3 nanometer light. Excited electrons don’t stay excited. In this case the really excited electrons don’t stay excited. They instead collapse back down to a lower energy level. When they do this they give their light off in random directions. We’re able to see that light that’s being given off in a random direction. Light that was meant to go from the star on the right off to somewhere on the left is instead going to hit a cloud of gas in front of me. The gas absorbs that light in that one color because it is hydrogen gas, reemits it randomly and I happen to be in one of the directions that that random light is being emitted so I see it. If I happen to be off to the left trying to look at that star through the cloud of gas what I’m going to see instead is hydrogen lines are absorbed. The light that should have gone straight through if I was looking through the cloud and it wasn’t actually there which sounds kind of silly; I’m not going to get to see it because of that cloud. Instead someone off in another direction gets to see that light. Fraser: This is one of the most used examples with the hydrogen emission and absorption but this is essentially the same technique that astronomers have used for everything. Pamela: For [laughter] absolutely everything. Fraser: Right they’re like well we’re seeing iron or we’re seeing all kinds of things in the atmosphere of the star or in this cloud of gas or what have you. Pamela: Yes and it is an amazingly powerful tool beyond the Doppler shift that allows us to measure red shift which gets us a distance for galaxies. Beyond being able to say wow the sun has titanium in it. I just am constantly amused with the idea of our sun having titanium for no logical reason. Beyond all of that we can get very accurate measures of temperature. Certain atomic transitions only occur at very specific temperatures. If I know this transition occurs between 4800 and 5200 degrees and I know this other transition occurs between 5000 and 5400 degrees I can start narrowing down that this star must be somewhere between 5000 and 5200 degrees. Wait there’s this other transition line that allows me to narrow this further. Anytime you see someone quoting a specific temperature on a star, it’s because they’ve looked at all these different transitions and said okay, based on what I know about what temperatures allow these different transitions I can accurately measure the temperature of an object that’s a hundred thousand light years away. That’s just cool. Fraser: You’ve mentioned this a couple of times now the other really useful tool for spectra is to be able to measure Doppler shift. How does that work exactly? Pamela: This comes down to knowing what the fingerprints of the light looks like. With hydrogen I know that I have this series of lines that if I generate them in a lab – and we reproduce most of this stuff in a lab as a sanity check – I know that in the lab the light is at 656.3, 486.1, 434.1, 410.2. I have this whole series of very specifically known lines that have a very specific set of separations. If I just look at a black and white image I can go aha, that set of separations, that for certain is hydrogen. If my camera is taking an image in the colors of light that my eye sees, I see exactly what my laboratory sees. If instead my camera is off taking an image in the infrared of a very distant galaxy I’ll get the exact same pattern but it’s now shifted to the infrared. To understand where it shifted to what we often do is take a picture of a lamp. Basically it is the very precise scientific version of that ‘Open’ sign made out of specific gases that you see at your local bar. We have our own versions of those. We take images of them to measure the fingerprints of the atomic spectra with our telescope with a non-moving source. Then we take a picture using the exact same set-up – nothing moves – of some distant object. We know what the fingerprint looks like in the observatory. We measure the fingerprint of this distant object. We look at how that fingerprint has shifted in wavelength. It’s that change where what I usually see with my eyes is now shifted to where I see it with my infrared telescope that allows us to measure that red shift, that velocity of the object moving that causes its color to change. All we’re doing is measuring the shift of an entire pattern of lines. Can’t do it with one. You need the separations of the entire pattern to say this is hydrogen. Then you measure the movement of the entire pattern because the object is moving through the sky. Fraser: How much of a shift would you see? I can imagine that if it is sort of square in the red and you were looking at some galaxy that was billions of light years away and traveling away from us, how far of a red shift would that galaxy have? Pamela: We can shift the initial transitions of hydrogen, the Lyman series of hydrogen which is normally so blue that we can’t see it with our eyes. It lurks out in the ultraviolet. Objects that are about halfway back in the universe, those lines start to creep in to where we can start seeing them with our visual telescopes. Fraser: So you would be able to see the spectra or as you wouldn’t be able to see it with Hubble for example. I guess Hubble can see in the ultraviolet a bit. Pamela: Yeah, the Hubble is happy at many wavelengths. Fraser: But an Earth-based telescope would start to be able to see the stuff even though it shouldn’t if it was right beside us. Fraser: Wow, that’s pretty cool. I think the other amazing thing about this technique is astronomers use it to find planets. Pamela: Right, what’s really amazing is we can use this technique to do so many different things. We can measure currently motions of stars that are about the same rate at which a normal person walks down a hallway, one meter a second. You can imagine tall guy one stride per second. We can measure a star moving at that speed using atomic spectra. Fraser: You could measure my spectra walking towards the telescope and then turning around and walking away and know the difference just from the color of the light that I was giving off. Fraser: That neon sign and walk towards the telescope and then stopped and then walked backwards away from the telescope it would be able to sense the difference. Pamela: It would be able to sense the difference. It’s not just atomic lines. This is the cool thing is spectra come from all sorts of different types of crazy transitions. We have the electrons jumping between energy levels. We also have electrons flipping. It’s called a spin flip. You have an atom that is oriented one way relative to the proton in the center and that has one energy. If you flip the electron over so that it has a different orientation relative to the proton in the center, that’s a different energy. We actually get very specific spectra that we can see in the radia. This is the 21 centimeter line of hydrogen that’s due to this flipping. With molecules you have bonds that bind the hydrogen and the oxygen and water together. These bonds can vibrate. So we’ll get entire bands in the spectra that are caused by the water vibrating a little, vibrating a whole lot depending on how much energy is in the water. Molecular bands are evil because they take up huge swaths of the spectra you can’t otherwise see through. We like to build telescopes where there’s not a lot of water in the atmosphere above them. We can get at all these molecular transitions. We can understand the flipping of electrons and atoms. We can even start to see how magnetic fields affect the electrons and atoms. This is called Zeeman line splitting. If you have atoms that are under an extremely large magnetic field you’ll actually have some of the energy levels that you see the transitions will just start to split into two slightly different energy levels. This depends again on different attributes of the electron as it makes the jump. It’s really complicated; it’s really scary. They had to make up entire new fields of math to deal with this. Fraser: Then I guess it is safe to say then, I think, tell me if I’m wrong, that all the light we see is being emitted by particles not atoms. Fraser: And all the light that we see that those emissions are happening when the energy level in the atom is changing and a electron is changing states and getting rid of a photon to make that change. Pamela: Most of the light. We’re almost there, there are always exceptions. Quantum mechanics likes to throw out ah, but this is another way to do it. The majority of the light that we see comes from electrons moving, molecules vibrating and light getting given off as a result. You can also have a neutron deciding, ah, I’ve changed my mind. I want to be a proton and an electron again. As the neutron falls apart after you’ve set it on the shelf for 15 minutes because I have to say that once per show, so after you’ve done that during that decay process you also get a bit of light being given off. During radioactive decay you get bits of light given off as well in many cases. Atoms falling apart, neutrons decaying all these sorts of things also give off bits of light. But the vast, vast majority is coming from electrons flipping, transitioning, and moving around and molecules vibrating. Fraser: And photons being released. Pamela: And photons being released. Fraser: That’s like when we see the light coming from the sun that is just I guess the heat of the sun, the temperature of the hydrogen in the sun’s upper atmosphere and those photons being released. It’s amazing. Alright, we’re not done with quantum mechanics and how it relates to astronomy or just how it is interesting in general. We’ve got a few more topics that I think we want to cover in the next couple of shows. Stay tuned for that. Thanks Pamela. Pamela: It’s been my pleasure Fraser. Somewhere along the way this excellent series has lost its focus and devolved into a non-ending littany of obscure theoretical lectures. Your early shows about the planets and their moons, star formation and overviews of theories of gravity and electromagnetism always left me wanting more. More recently, your topics simply remind me why academia has no sense of what the general public desires. You think spectra is an obscure theory? It’s like the bread and butter of astronomers. 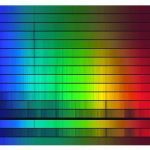 Many (most) most astronomical discoveries are made using spectra. It’s how they know how fast something is moving, what it’s made out of, how old it is, and what it’s related to. I like what is being provided. This last episode is a bit of a tie in to all things spectra theme that helps us to understand how scientist are exploring our universe. Granted, I had to listen to the Energy Level and Spectra podcast 3 times to start to grasp it, but its not Pam and Frasier’s fault that I cannot always pick it up on the first listen. My next request would be to hear Dr. Pamela Gay tell us what she thinks of the Craig Hogan idea of the universe as a Hologram, backed up by preliminary findings on the Geo600 project, bet I would really stub my toe on that subject! Great work guys, I recommend you highly and hope the episodes continue to flow from you like water from a spring. I have been longing for these topics to be covered. It totally helps me tie together some of the loose concepts floating around in my head.